Cooking with certain fruits is always a dilemma for me. The change of texture and taste brought about by the cooking process can elevate or demote the natural form and beauty of the fruit in question. Take mangoes for instance. I’m always wary of cooking with them for the fear of disrupting their natural elegance or not giving them their due by doing justice to their regalness by subjecting them to improper cooking methods. But peaches are a different story altogether. 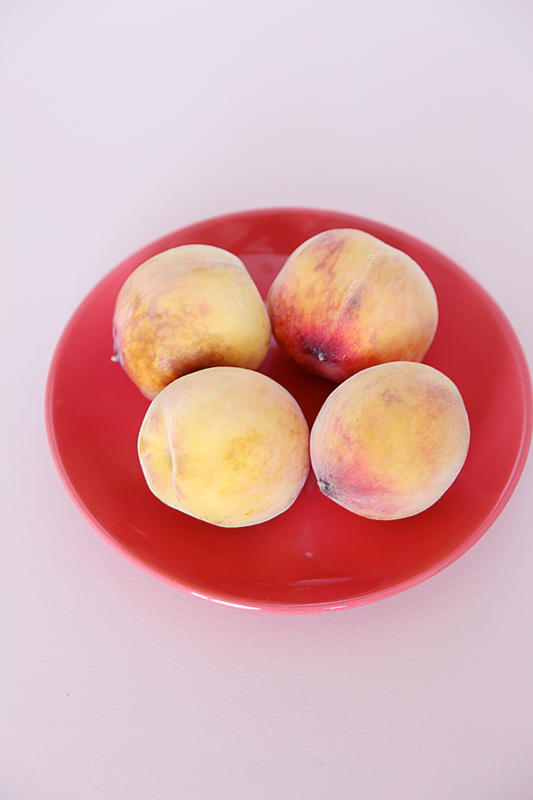 Subject a peach to some heat in the form of baking, roasting or frying and the amazing transformation in terms of its velvety smooth texture and enhanced sweetness totally encapsulates your senses. To me, a peach is always better off when cooked. 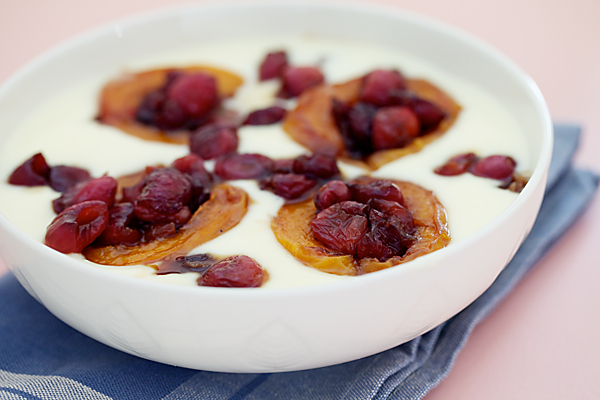 Stone fruits like peaches, plums, apricots and cherries are here and this is one of the best recipes to make use of their short seasonal appearance apart from devouring them in their natural state. On a whim, I decided to stuff the deseeded peaches with some cherries and it turned out to be a decision that I did not live to regret. Infact at the cost of sounding a little immodest it was spectacular enough to make me pat my own back! This is one of those desserts that make you want to sit next to a window listening to the sound of the falling rain in the background, holding your favourite book in hand and savouring the sweet warmth spoon by spoon. 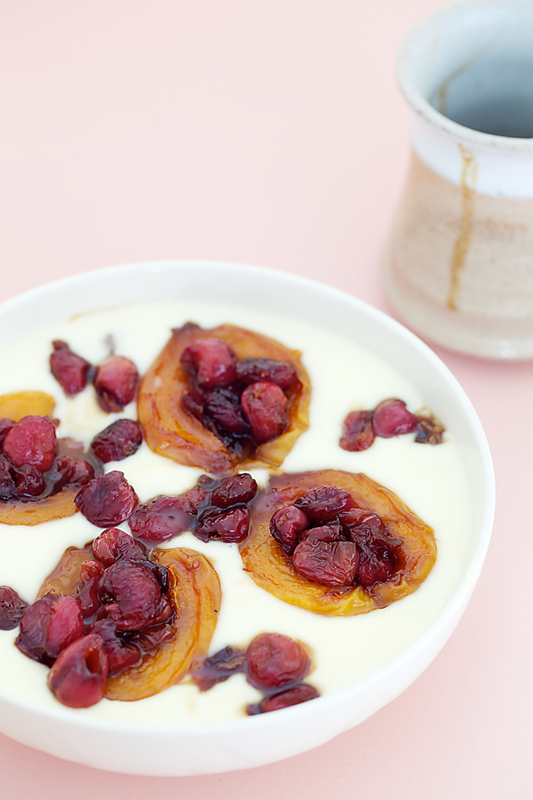 The succulent texture of the peach is enhanced by the caramelization and the sweet bursts of cherries with the warm creamy custard prove to be pure ambrosia. Besides, it is so easy to put together for a party or a weekend dessert for the family. I love to serve this with warm custard but depending on the weather outside and personal preference this could be served cold or over good quality vanilla ice cream if you want it to be super quick. 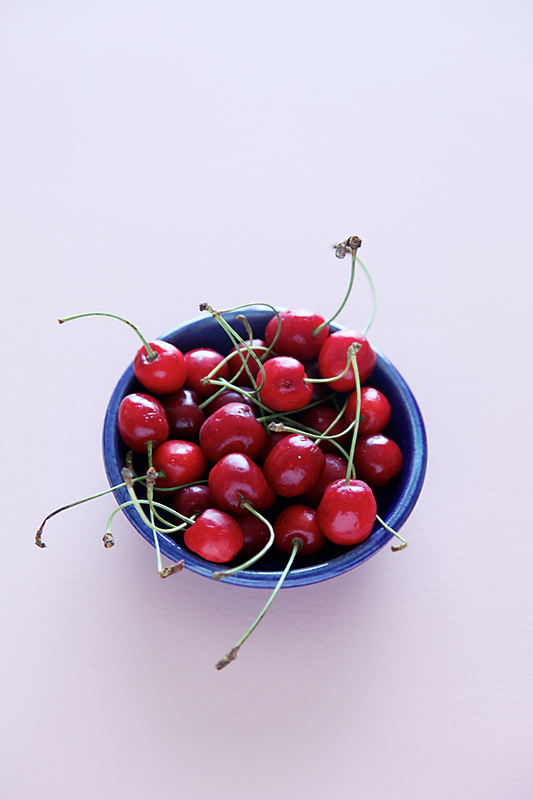 You can use other seasonal fruits instead of peaches and cherries like apricots, plums and apples. In a large saucepan, heat the butter over medium flame and when it melts, lower the heat and stir in the the sugar. When it melts add 3 to 4 tbsp of water and stir well. This is to prevent the sugar fro, turning into candy while cooking the fruits. Place the peaches, cut side down and scatter the cherries in between the peaches and cook for 8 to 10 minutes over medium to medium low heat until the fruits are caramelized and the peaches get a beautiful golden brown coat over them. Carefully remove the fruits and place them on a plate. Stir in 1/4 cup milk into the remaining sugar syrup and cook over low heat, stirring all the while for a couple of minutes. Do not worry if the milk appears to split slightly, it gets bound when stirred after taking off the heat. 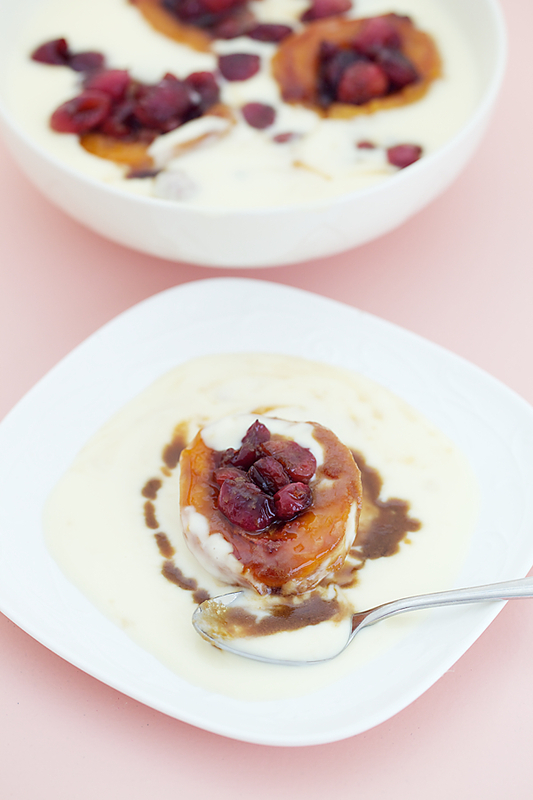 You can serve this caramel syrup with the fruits and custard. In a bowl, mix in the custard powder and the water into a smooth paste. In a saucepan mix the cream, milk and sugar and bring to a boil on low heat. Stir in the custard paste and mix well until thick and creamy, about 2 to 3 minutes. Take off the heat. In a bowl, place the custard and allow to cool to room temperature or warm if desired. Stuff the cherries into the peaches and place them carefully over the bed of custard. Scatter the cherries besides the peaches. Such a simple and delicious looking dessert. Looking at the weather I will try a chilled version of this one. I made a peach cobbler today and can't agree more peaches taste best when cooked. 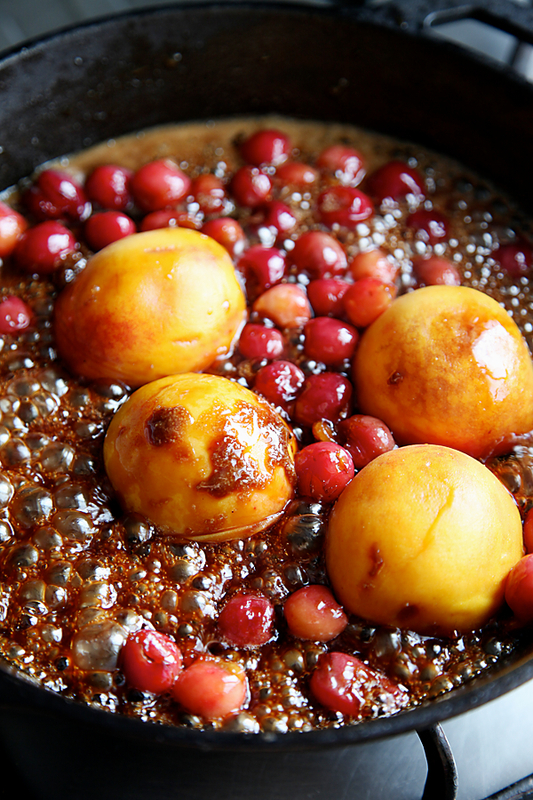 i loved the pics of the cherries and the poached fruits all simmering in the process of carmelising! Wat a lovely presentation and I almost imagined sitting by the window and watching the rain…only am in chennai now on vcation and getting a little roasted in the heat! and there is no rain!!! Lovely! Will be making this for dessert tonight. Such a perfect way to begin a week. Thanks for sharing. Nandy: Thanks for the feedback. Glad you enjoyed the dessert.